I am concerned that I may loss my Italian-American status... I have not given you a pasta dish in quite a while and now that the harvest is really coming in it is time for a raw vegetable salad. To me this is the best of Italian cooking...using the freshest ingredients when they are at their peak is really what simple Italian cooking is all about. Now please, when you put this salad together do not neglect to add the anchovy paste. I promise you it will not taste fishy. Anchovy paste naturally contains glutamate which is a flavor enhancer. I've written more about this magic ingredient found only in certain foods in my article: The Height of Flavor. Check it out and trust me on this one. 1) Bring a large sauce pan of water with about 2 tablespoons of salt in it to a boil. 2) While waiting for the water to boil whisk the vinaigrette. 3) Chop the vegetables and add them and the vinaigrette to the pasta when it is cooked. Chill for 2 hours or over night. Cucumbers, Asparagus, and Avocados all brought together by curry... a must try summer soup. 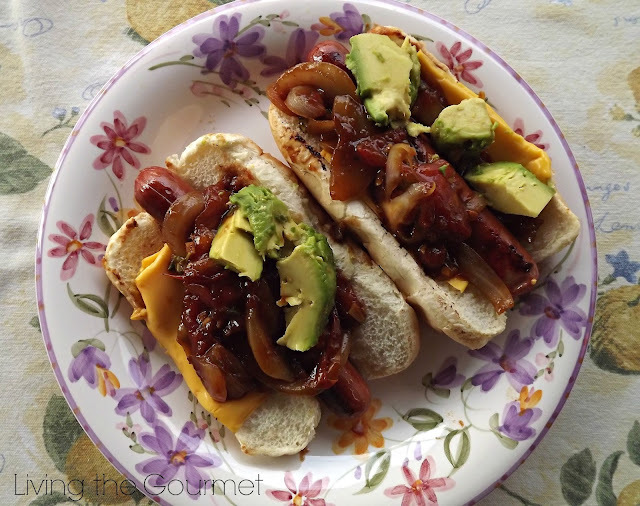 Now this recipe seriously steps up hot dogs... it have healthy veggies and a kick of jalapeno. 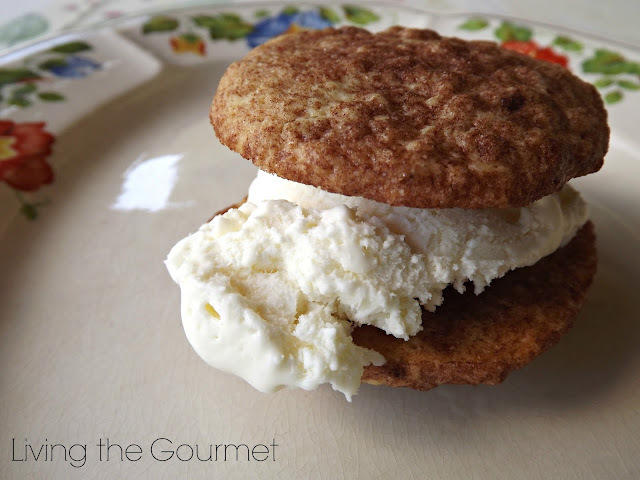 Homemade ice cream sandwiched in between a fresh snickerdoodle cookie... genius. Thanks for the party, hope you're having a great week ! What a delicious salad! You automatically get extra points for not using a bottled Italian dressing...like I do :) Thank you so much for the party Diane. Have a wonderful weekend! I use the bottle on occasion... but it really does taste better fresh especially if you use extra virgin olive oil. Your salad looks delicious. Thanks for hosting the party. Thanks so much for hosting! Your salad looks great...and I love cold soup, but my husband does NOT. :-( So sad. I just love your features this week, Hamburgers and Hot Dogs, easy and delicious. Hope you had a good day and thanks for a great party! I'm going to have to try the anchovy paste in my pasta now. Looks great Diane! I know it sounds fishy... but trust me. Of course you don't have to use anchovy... mushrooms are umani enhancing too. Your salad sounds wonderful Diane Using garden fresh ingredients is the best part of summer. Thanks for hosting each week. I brought a Spicy Black Bean, Corn, and Shrimp Salad. Thanks so much for hosting, Diane!! Thanks for another wonderful party Diane! I hope you have a terrific weekend. Happy Friday! Thanks for hosting - your pasta dish looks so good!! I hope you will... I never realized how much flavor it adds until I started reading about more traditional Italian cooking. Great to see you back Rebekah. You are very welcomed. Catherine your recipes are terrific... I so glad you joined our party. I will look forward to checking out what you share. 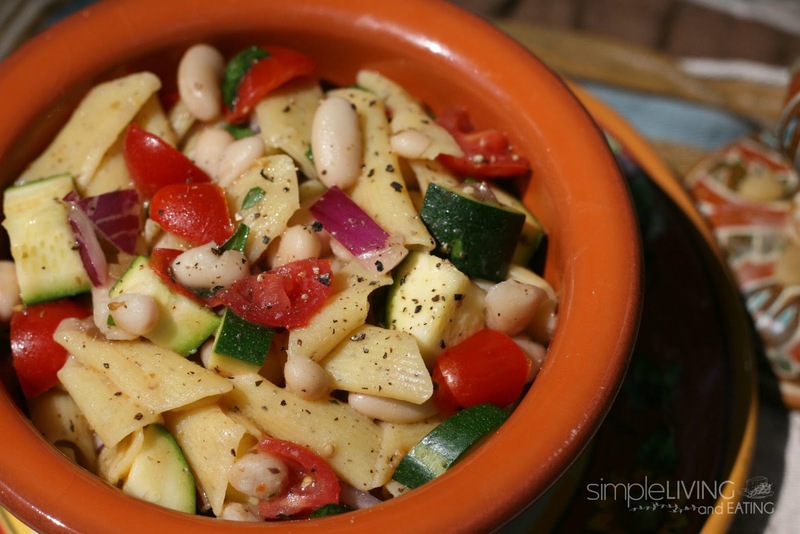 Love this simple yet tasty pasta salad! Thanks for the party dear.. I agree, anchovy paste is such a wonderful ingredient, and it never, ever tastes fishy! 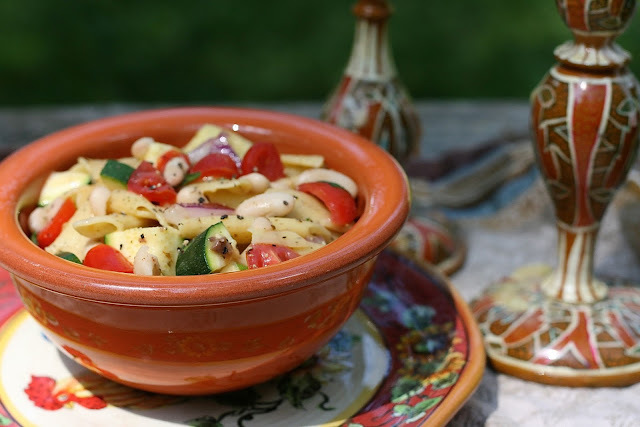 Your Italian Pasta Salad looks fresh and delicious, perfect for a late summer evening. Thank you for sharing it with the Hearth and Soul hop. I hope people read your comment. It really is true but so hard to get people to try it. We would just love your Pasta Salad it looks delicious. Hope you are having a great weekend and thanks so much for sharing with Full Plate Thursday!